The 5,500-square-foot ground floor restaurant and kitchen, with an additional upstairs apartment and storage area for a total of 7,300-square feet, has been listed for $739,000. The indoor area seats up to 145 people, and the patio can seat 90 more. The building — originally built in 1890 — is located at the corner of Hwy. 20 and Scotts Flat Road. A take-out menu also is in the works, geared toward picnicking and camping in the surrounding area, including Scotts Flat Lake. The area has a new bike path too. This will be a significant contribution to our area. Go Jim, Simon and crew! Excellent article Jeff, considering it is your anniversary weekend. All Ol’ Republic will have to do now is offer transportation to and from the 3 1/2 Mile House ( the actual distance ) and Boiler Makers with your choice of liquor and beer. Best of luck! I have enjoyed OL’ Republic brews from day one. 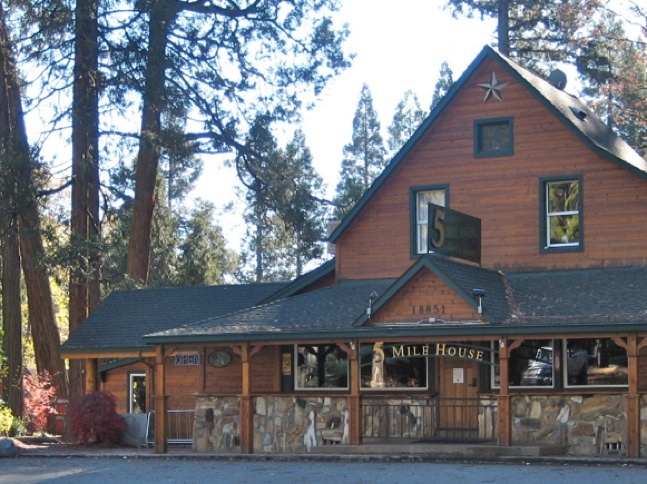 Like the Stone House, the secrets to successfully operating 5 Mile House remain illusive. 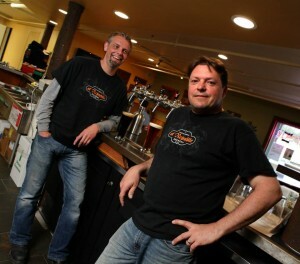 Adding an eatery to a brewery has always had its risks and 5 Mile House is going to pose a particularly strong challenge. The pairing is as unique as it is risky. Shoot for the stars! Selfishly I’d love to ride my bike to the back porch and have one or more of your brews with a pizza. Again, best of luck – I’ll be certain to do my part and send business your way. Uber-drivers, or something like it,(“Sober-drivers” ?) could shuttle folks safely to and from home from their festivities. I’ll bet a lot of people would add safe transport to their evening’s budget and find the cost well worth it. BTW, Brad and I have noticed the emergence of small craft distilleries showing up at fairs and trade shows. They seem to be gaining in popularity for folks who enjoy spirits. Is anyone planning on something like that for these parts? Yes, there are a couple regional distilleries we have written about in our magazine. Their Dargeeling gin won “best of show” for gin at the 2014-15 World Spirits Competition. “It is really a ‘gin fancier’s’ gin,” says Darrell Corti, owner of Corti Brothers in Sacramento, which carries the gin. “We welcome more comprehensive changes to outdated alcohol and beverage control laws, so that California can become the leader of the distillery industry,” said Cris Steller, CADG Executive Director and partner in Dry Diggings Distillery, based in El Dorado Hills (5050 Robert J. Mathews Pkwy, El Dorado Hills, 95762). Restaurants come and go everywhere, but that location seems to have more challenges with owners staying in business than others. It sure is nice on a warm summer evening. I hope they don’t regret taking it on.